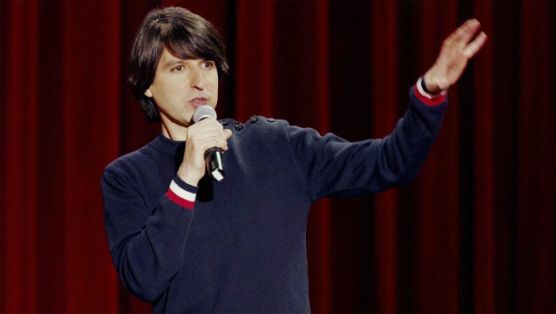 Demetri Martin’s comedy style is summed up pretty much perfectly in the title of his latest stand-up special, his first in three years. It uses language to twist our expectations, and is unconcerned about such wordplay feeling corny or old-fashioned. He’s no relation, but between the love of words and inevitable musical interlude Demetri Martin is clearly indebted to Steve Martin, who transitioned out of stand-up comedy in his mid 30s. Live (at the Time) is a fine hour of stand-up, but the feeling that the younger Martin’s time has passed hangs over it from start to finish. It takes time to put together an hour of material for a comedian like Martin. He’s a craftsman. He’s the kind of guy who constructs palindromes for fun. In an era where comedians are getting more and more personal, and structuring their comedy around long stories, Martin remains almost defiantly a joke teller. You don’t learn anything about Martin other than the kind of stuff he finds funny. In fact, when he makes a joke that seems to possibly be sort of about him, he immediately registers discomfort with having told it. He is neither right nor wrong in this. He is just increasingly rare because of this fact. There is no reinventing of the wheel in Live (at the Time). In fact, it’s less inventive than some of his prior work. There is no sketch pad or anything like that. It’s mostly just him and a microphone on an otherwise empty stage. Does he bust out his guitar and his harmonica? Of course, but it feels almost tossed off. It feels like the music is hiding the fact that the jokes he’s telling are half-baked. A couple didn’t even really qualify as jokes. Since this special is on Netflix, he gets a full hour, without commercials, and he gets to swear and such. That might seem like something new for Martin fans, but it’s not enough, especially in an increasingly inventive world of stand-up specials. Martin decides to live and die with his jokes, and fortunately for him, he mostly lives. He’s a more cerebral Mitch Hedberg, dishing off one liners stemming from his flights of fancy, and in particular the loopholes he has found in the English language. He has some very funny and sharp bits about language use, as always, and some other keen observations. He tells jokes about wishing “Bridge May Be Icy” signs were more positive, and about the aerodynamics of crackers. No topic is dwelled on. He makes his little insightful, humorous comment, and then he moves on. Most of them are funny, some of them very funny. Live (at the Time) is quite good at times, but it’s not Martin’s best stand-up special. Maybe that’s why so many stand-ups turn to telling stories. It’s hard to generate so much new content, to find so many things to make observations about. Hedberg’s last album was his least successful. People seem to be tired of Jerry Seinfeld. Martin will always be smart, which means he has a good chance of always being funny, but the concern now is that perhaps he is not an infinite font of amusing insights. A guitar and a harmonica can’t hide the truth. Martin is a good comedian, and this is a good stand-up special, but he’s not a miracle worker.